August - December 2011 – 10:00a.m. Location: Valley Library, Oregon State University. *Note: Interview recorded to audio only. Chris Petersen: Please introduce yourself and give today's date. Steve Lawson: Steve Lawson, today's date is December 15th, 2011. We are in a conference room in the Valley Library. CP: Okay Steve, today we are going to do something a little different from past sessions. What we are going to do is go through a list of names of people that either worked at the Institute or were affiliated with it in some way and I'll ask you to give your recollections as to the roles they played at the Institute and any sorts of memorable interactions you had with them. A lot of these folks are people you touched on over the course of our talks already. So the first one is Zelek Herman. SL: Zelek Herman joined the Institute, I believe, in the late 1970s. He had had an academic position at Stanford University and had come, I believe, from New York City prior to that and worked very closely with Linus Pauling on theoretical problems in structural chemistry. To the best of my recollection, he also had a strong background in statistics, so he helped people at the Institute with biostatistical analyses and participated in the analysis of some of the data that Ewan Cameron was generating - cancer mortality data with vitamin C and cancer studies in Scotland. In the mid- to late-1980s, Linus Pauling came up with an idea for a novel fabrication technique for superconductive material that was different from the prevailing ceramic work that many people were doing. And Pauling approached Zelek and me to set up a laboratory in Stanford Industrial Park to carry out some experiments to confirm his ideas about the way this material could be fabricated that would be supportive of a patent application. So Zelek and I set about buying a furnace and blowtorch. We had a facility already at Porter Drive. And Zelek came up with an ingenious way to collect this material, which essentially consisted of very thin tin fibrils that were clad in borosilicate glass. The glass surrounded the tin made at the point of maximum temperature over a furnace, helped by a blowtorch. We needed to collect these long strands of tin encased in glass, and Zelek came up with a terrific idea which was a bicycle frame, upside down, mounted on a wood platform. There weren't tires on the rims, they were just bare rims. One person would be at the furnace, wielding the blow torch, melting the glass at a very steady rate - very controlled, very steady, very exact, precise operation. As the glass and the tin inside was melted, it was collected onto the back rim of this bicycle frame. Then the other person would be there threading the glass onto the wire rim of the bicycle and then engaging the pedal mechanism. It worked quite well. Zelek and I maintained a notebook, according to Linus Pauling's standards, that were countersigned by Emile Zuckerkandl, either at the end of every day or at the end of every week so that a third party uninvolved in the experimental work could testify that they had read it and understood it. And I got to know Zelek pretty well through that whole process. Of course, he had been at the Institute for a very long time. His tenure there almost exactly coincided with mine. I can't recall if I got there a little before him or a little after him but know that he arrived in the mid- to late-1970s. I got to know him very well over the years and really respected and admired him. I think he had the desire to devote his career to a scientific relationship with Linus Pauling, and Linus Pauling depended on him very greatly for this work that he himself might not have had time to do. Zelek was able to talk with Linus Pauling about some of the more abstruse problems in theoretical chemistry that some of us at the Institute were probably not able to discuss easily with Linus Pauling. CP: What became of Zelek? SL: When the Institute was wrapping up its activities in Palo Alto, Zelek was very important in that whole operation. He had become the Institute's Safety Officer, so he worked very carefully and closely with the Palo Alto fire department, with our hazardous materials plan, which we didn't really have prior to Zelek taking that position. He also helped me a lot by serving as my surrogate when I was away from the Institute. At that time I was Chief Executive Officer, and when I was gone, Zelek very kindly and effectively offered to stand in for me and solve problems as they arose at the Institute in my absence. He did a terrific job at that as well. Zelek also participated very closely in the analysis of the closure of the Institute; hiring of the moving firm, disposal of furniture, laboratory equipment, chemicals, and so forth. So he was involved in that whole process very thoroughly on a day to day basis in the last few years of the Institute. The Institute was not in a position to secure employment for LPISM employees at Oregon State University. There had been a number of visits by Oregon State University faculty and administrators to the Palo Alto facility to talk with our scientists there about whether or not they were interested in coming to Corvallis to become part of Oregon State University, and whether there would be a good fit for those candidates in OSU's academic units. Oregon State University ended up not offering a position to Zelek, to the best of my recollection. After that, he did some work, I believe, for Stanford and also did some teaching in the Palo Alto public school system. CP: He and Dorothy Munro compiled the original Pauling publications bibliography, were you involved in that? SL: I was not involved in compiling or editing or managing that project, but they did an outstanding job. Zelek is very meticulous. He has a very keen eye for detail; he'd make a good editor. And he was driven to make sure that the collected papers of Linus Pauling was as thorough and complete as possible. He worked very closely with Dorothy on that project, and of course with Linus Pauling as well, because Pauling himself had to provide some reprints of some papers that were quite old and weren't part of the Linus Pauling Institute of Science and Medicine inventory or library. That was a really terrific project that Zelek and Dorothy did jointly. And of course, that was the nucleus for a project that was then taken up by Special Collections here at Oregon State University, and then expanded to this five volume set that was recently published. CP: How about Dorothy Munro? SL: Dorothy was a terrific person. She had been at the Institute, I believe, nearly from its inception. She worked ostensibly as Linus Pauling's secretary, but that term doesn't really do justice to the comprehensive nature of her duties and responsibilities. She assisted Linus Pauling in all his travel arrangements, managed his calendar for appearances, prepared his manuscripts to be submitted for publication in different journals, managed his correspondence, and also transcribed his numerous dictaphone dictation belts. So she played a very, very important role in Linus Pauling's life, keeping everything straight and organized, and really providing personal and secretarial assistance to him. I think that she was invaluable. I don't think he could have managed without Dorothy Munro. CP: How would you describe her personality? SL: Dorothy was an interesting person; she was not very extroverted, maybe a little skeptical, but I really enjoyed her. We had some good laughs. Mainly our humor was based on sort of cynical takes on Institute affairs. When she found something funny, she was really prone to some hilarity, but it took a bit to get over that threshold sometimes. SL: Richard Hicks was at the Institute when I joined; he was a former stockbroker or administrator with Merrill Lynch. Richard Hicks' first wife had died of cancer and that stimulated his interest in what Pauling called orthomolecular medicine - the prevention and treatment of disease with micronutrients, in particular vitamin C. And Rick joined the Institute in the mid-1970s when Art Robinson and Linus Pauling and the board became convinced that we needed some managerial experience and direction at the helm of our fund raising efforts, which at that time included contact with foundations, philanthropists, larger donors, and people interested in Linus Pauling's work, as well as a mailing list. So Rick organized and managed all that and also was very engaged in travel with Linus Pauling that had a fund raising aspect. He traveled with Linus Pauling quite often in the '70s and '80s. CP: If memory serves, he left the Institute at the same time as Zuckerkandl? SL: He did. There had been a couple of conflicts at the Institute, one involved Pauling, Hicks and Art Robinson, which led to Art Robinson's departure. And Art, I believe, at some point wanted to fire Rick Hicks, but he was prohibited from doing that expressly by the board and Linus Pauling, which led to this administrative conflict that led to Art's departure. There were other reasons for that, but that was one element of that conflict that arose in the late 1970s. When Emile Zuckerkandl became President and Director after Robinson's departure, Rick Hicks worked very closely with Emile over the years to try to find funding for the Institute's research activities and our educational activities. So the two of them worked extremely closely and with Linus Pauling, as his schedule permitted, to find and cultivate donors who could support some of our projects at the Institute. And then when the Institute was reorganized after Emile's retirement, Rick decided partly because of his long, close association with Emile that the time had come for him to resign as well. After he resigned from the Linus Pauling Institute of Science and Medicine, he was offered a position on the board that he accepted. He also had a position with Emile's embryonic institute, the Institute for Molecular Medical Sciences, which was subleasing space from us in the same facility at 440 Page Mill Road. CP: Did he retire after that job or did he go onto something else? SL: Well, the Institute of Molecular Medical Sciences, to the best of my knowledge, never really reached critical mass. They had a few employees early on and then when the zoning change finally kicked in that building was scheduled for demolition. I think that was the effective end of that organization. I don't know whether Rick continued any active role with IMMS after it lost its physical existence at 440 Page Mill Road. But Rick has remained a big advocate and friend of the Linus Pauling Institute over all these years, and I talk to him reasonably often. He comes to visit us in Corvallis during big events, like the tenth anniversary party. He couldn't make it to the grand opening of the Linus Pauling Science Center but he sent flowers, and he has always been a good friend of the Linus Pauling Institute. CP: Is Zuckerkandl affiliated with anybody at this point? SL: Well, Emile is quite elderly now. I think he had an adjunct position at Stanford that probably overlapped with the existence of IMMS, but I don't know if he retains any courtesy or adjunct appointment at Stanford any longer. CP: So he is semi-retired? SL: I think so. He is the founding editor of the Journal of Molecular Evolution, which is one of the leading journals in that field, and I think he has retired as editor of that journal. He's an editor emeritus now. CP: How about Raxit Jariwalla? SL: Raxit Jariwalla joined the Institute from Johns Hopkins in the early 1980s to head the laboratory of viral carcinogenesis. At that time, Emile's plan for the Institute was to expand along the lines of the Salk Institute in La Jolla, with important projects in orthomolecular medicine and molecular biology. Raxit's work was an example of the work in molecular biology. In particular he was interested in herpes virus and cytomegalovirus that could transform normal cells and make them tumorigenic. I collaborated with him on several projects. There was a donor in Long Island who had developed some very interesting ideas about phytic acid and cancer. Phytic acid is an antioxidant that you find in grains and seeds that protects the germ plasm material in a seed from oxidative damage before germination. He had approached either Linus Pauling or Emile Zuckerkandl with some of these ideas, and then I started talking with him and we set up a small experimental research program to carry out some cell culture experiments. Raxit and I started directly collaborating at that time. We worked together on using 2D gel technology to profile proteins in rat cells that had been transfected with virus DNA fragments. I developed quite a lot of skill at producing these protein profiles, and Raxit was very interested in that, to find out how gene expression changed as a result of neoplastic transformation in these rat cells. I collaborated with Raxit on a number of different projects over time. In the late to mid-1980s, as AIDS was becoming a public health crisis in the San Francisco Bay area, in New York, and some other places, there was interest in finding out - once HIV had been identified as the causal factor, the etiologic agent in AIDS - there was interest in finding out whether or not vitamin C might have any beneficial effect in people infected with the virus. In collaboration with Linus Pauling and Steve Harakeh, who had been recruited to work in Raxit's group, he published a paper in PNAS showing that, in cell cultures, human t-lymphocytes infected with HIV did not develop certain pathological characteristics when they were grown in physiologically relevant concentrations of vitamin C in the medium, and that vitamin C also inhibited replication of the virus, which could be assayed with a number of different techniques. The suggestion in that paper, if I remember correctly, was that there may be a combinatorial approach to treating AIDS that would involve AZT, which protects uninfected cells from being infected by HIV, combined with vitamin C which would inhibit viral replication. So you are inhibiting viral replication and protecting uninfected cells and that would be a good therapeutic strategy for AIDS patients. So far as I can remember, that work didn't result in direct collaboration with physicians at San Francisco General, which was a major AIDS treatment facility in the United States. But the people from Ward 86, Paul Volderding and Don Abrams, came to the Institute to give seminars on some of their experiences in treating AIDS patients. And of course a lot of AIDS patients in San Francisco were self-medicating with high-dose vitamin C, and the physicians at San Francisco General had some anecdotal evidence that seemed to support some value for vitamin C.
CP: And where did Jariwalla end up? SL: Raxit was not offered a job by Oregon State University, I believe he took a job with the California Institute for Medical Research in San Jose. He had some grants from California Pacific Medical Center, I believe, in San Francisco that were sustaining his research activities. Most recently I believe he has joined Dr. Rath's research institute which is located in Santa Clara, CA. CP: How about Constance Tsao? SL: Constance Tsao had been at the Institute for a very long time. She was there when I joined in 1977. She was a chemist who had been hired to do a lot of work with vitamin C. Of course, Linus Pauling was very interested in the biochemical functions of vitamin C in the body. There had been some red flags about high-dose vitamin C - whether it could destroy vitamin B12, whether it would cause kidney stones, whether it would leach minerals or amino acids from the body, or interfere with amino acid metabolism. - Connie Tsao in collaboration with Linus Pauling - and she had a small staff to help her as well - was addressing a lot of these concerns about high-dose vitamin C. She was also directing a lot of work that was geared towards understanding the pharmacokinetics of vitamin C. In other words, if people take an oral dose of vitamin C, how much shows up in the urine and what is the resulting blood concentration? So she was doing studies like that, also trying to get at the role of vitamin C as an anti-cancer agent. Initially, Pauling and Cameron emphasized the role of vitamin C in increasing host resistance to cancer. Over time they started to develop some new ideas involving direct cytotoxicity of vitamin C, metabolites, or degradation products. Vitamin C, when ingested, can transform into other chemical moieties that have different attributes. Part of Connie Tsao's research program was to identify some of these breakdown products and metabolites of vitamin C and to find out whether they had any anti-cancer effect in cell culture studies and in small animal studies. She was quite successful in this and published a number of papers showing that degradation products of vitamin C seem to possess strong anti-cancer activity. And she also did some work, I believe, that was stimulated by reports from Japanese researchers, Morishige and Murata, that vitamin C combined with a copper tripeptide had very interesting anti-cancer effects. The basis for that involves free radical chemistry, so that's something that Connie Tsao was pursuing as well. CP: How long was she at the Institute? SL: She was at the Institute until we closed our doors in Palo Alto and then she retired. CP: I wanted to ask you about Akira Murata and Fukumi Morishige as well. SL: They were Non-Resident Fellows of the Institute - there had been a number of Non-Resident Fellows appointed over the years. So far as I can recall, they never carried out any experimental work at the Institute's facilities either at Menlo Park or Palo Alto. But they had long-standing and far ranging discussions with Linus Pauling about the effect of vitamin C in viral infection and cancer. I think their earliest work had to do with preventing transfusion-associated viral hepatitis in hospital patients in Japan. They showed that by giving vitamin C to transfused patients, they were able to decrease the incidence of transfusion-associated hepatitis to almost negligible levels, and that of course intrigued Linus Pauling greatly. They also developed an interest in vitamin C and cancer, which involved this copper tripeptide, and carried out animal experiments, cell culture experiments, and even some, surprisingly, clinical work with the copper tripeptide and high-dose vitamin C typically given intravenously. They published a number of papers and monographs. CP: I know that Morishige was interested in mushrooms too. SL: Yes. And Murata has remained close to the Institute - he's been a supporter of the Institute for many years, even since we moved here to Corvallis. Morishige, I am not sure what's become of him. I don't know what his current status is. But I know that in late '80s and early '90s he did become increasingly interested in the beta-glucan fraction of maitake mushroom in particular. That glucan fraction is also present in other mushroom varieties. I think he had done some cell culture and, maybe, animal experiments to show that not only did it have immunostimulatory properties but seemed to have anti-cancer properties as well. There's quite a big literature on mushroom extracts and their anti-cancer effect, but as far as I can recall, none of that took place at the Linus Pauling Institute. CP: They did visit the Institute though at that time? SL: They did, and I think that one of them also spent some time with colleagues at Stanford University, but I can't really recall the details of those associations. CP: How about William Aberth? SL: William Aberth had come to the Institute from SRI, which at that time was known as Stanford Research Institute International. It had been originally affiliated with Stanford University then became an independent entity, which is where I learned to do cell culture in the 1980s when I set up our first cell culture lab at the facility in Menlo Park. Aberth is a physicist who developed the volcano-source field ionization mass spectrometer that was used in Pauling and Robinson's metabolite profiling program. He was constantly developing that, trying to improve its parameters and improve the technology. That was his primary role at the Institute. He is also a really great ping pong player. We played ping pong quite often at noon, and he invariably beat me. CP: So he designed instruments then? SL: He did. He designed instruments and worked on their technical development. It was always a bit of a, I won't say conflict, but there's always some stress there between instrument design and development and the biologists and biochemists who actually want to use the instrumentation to gain data and then analyze it. The physicists always want to improve the technology; the biologists want the technology to get to a certain acceptable level and then keep it constant and run lots of samples. Because if you keep changing the technology over time, then the sample analysis changes over time too, and it makes it very difficult from a biological perspective to understand what's going on with some of these things. So it was interesting. CP: Does the Institute have anybody like that now? CP: Is that something that is still around? SL: Well metabolic profiling, what Robinson and Pauling were doing, was really cutting-edge technology and cutting-edge science. I believe that there's a lot of interest in that now that may use slightly different technologies but nevertheless has the same goal of understanding preventative medicine. The idea was to try to detect very subtle biochemical changes that would be reflected in body fluid or - typically urine was used because it was easy to use experimentally - that might correlate with a predisposition to particular pathological states like cancer. And also to use it as a diagnostic tool so that you would, for instance, take samples from hundreds of people diagnosed with a specific disease like muscular dystrophy or multiple sclerosis and then look for clues in the metabolic profile run through this mass spectrometer that might correlate with that particular condition or physiological state. For instance, if you found in a population of people with a particular type of cancer, a representative or a set of representative peaks on a spectrogram that correlated with that condition and you did not find those peaks in normal healthy people, then ostensibly you could use this to check someone's health over time to see whether or not those substances represented by those peaks are starting to amplify in the healthy person's profile over time. If they are, then you could suppose that there are biochemical events taking place in that person that are leading to cancer. And if you had that knowledge very early in the disease process, then you could implement therapy much sooner and probably have better therapeutic outcome. That kind of thinking was extraordinarily prescient and way, way ahead of its time. CP: Yeah, if memory serves it started with the schizophrenia work. SL: They had at one point under Art Robinson's direction a repository of urine samples or blood samples from neonates collected through the VA hospital and other hospitals around California. These samples would be held at -80 degrees centigrade for decades and then you would check on these people to find out what had happened to them, if they had developed certain diseases, and then look at these samples to find out if there were any clues about predisposition to particular diseases. I think it was a very interesting program but eventually stopped because of funding issues and some technical issues. For example, the volcano source, which is where the ionization of these volatile components took place, tended to erode and material would accumulate on it that could contaminate subsequent sample analysis. So there were some practical problems with 'how do you clean this cone between samples' and the life span of the cone. Those things are what Bill Aberth and the people that took over that project worked on for years. CP: How about Alan Sheets? SL: Alan Sheets was at the Institute when I arrived - he was working in biochemistry. He was operating and developing gas chromatography and instrumentation to do this kind of work, the metabolite profiling work, using not just human samples but with a focus, I think, on rodent samples. Analyzing mouse urine, typically using gas chromatography. He was an expert on gas chromatography and worked very closely with Bill Aberth, as well as Art Robinson. We developed a friendship and he wanted me to get more involved in some of the work that he was doing in the laboratory, so Alan and I set up some experiments for Ewan Cameron. Cameron was very concerned about high-dose vitamin C for people undergoing chemotherapy because vitamin C can have detoxifying capabilities and Cameron was concerned that if chemotherapy is expected to be therapeutic for cancer patients, you don't want to interfere with it. If high-dose vitamin C interferes with specific chemotherapeutic drug activity, then you don't want to recommend it to people undergoing chemotherapy, or perhaps you want to alternate it with chemotherapy that is typically given in cycles. To get at this question, Alan and I set up a fish toxicology experiment using fingerling trout. There is a lot of literature in fish toxicology and how to make experimental aquariums for fish, so we followed that literature and set up some experiments to look at the combination of methotrexate and other chemotherapeutic drugs alone and in combination with vitamin C on swimming behavior in the fish, because when fish aren't feeling good they stop swimming. There are ways to monitor the movement of the fish in the tanks, and that was one of the last experiments I did with Alan. Alan was very closely involved in the move from Menlo Park to Palo Alto because, I think, his father had worked as a mover or had a moving company in Idaho. Alan had experience in moving, and we handled the move ourselves from the Menlo Park facility to the Page Mill Avenue facility in Palo Alto back in the winter of 1980-1981. Alan coordinated that move and also, I think, worked pretty closely with Emile Zuckerkandl in the design and set up of the new laboratory facility at 440 Page Mill Road, because we were moving into what had been a battery factory, and it needed to be reconfigured for our work. I think Alan played an important role in that as well. Then eventually he retired. I think he became less interested in biochemistry and more interested in physical therapy because his daughter had been born with muscle problems, so she didn't have a very graceful gait. Alan became very interested in physical therapy that might help his daughter to have a more normal gait, so he eventually adopted that as a new career. SL: Wolcott was a retired physician who spent most of his career in Tennessee at the VA hospital, if memory serves me, and then had worked in the Jackson Laboratory in Maine for quite a long time. I can't remember exactly why he came to the Institute but, in the early 1980s, he set up a program to look at the effect of neurotoxins on guinea pigs and whether they could be protected or rescued from toxicity with vitamin C.
The toxin was beta-aminopropio-nitrile which is a compound in the grass pea, a legume that people in India and other places consume. It has the unfortunate characteristic of causing leg paralysis, so when you consume the grass pea or products made from the grass pea over a long period of time, you become very vulnerable to irreversible leg paralysis. It affects the central nervous system and nervous tissue, causing neurolathyrism. Of course, when somebody develops neurolathyrism they can't work any longer. It was a big public health problem in some regions of the world because the grass pea provided nutrition - it's a legume so it has some nutritional value and it grows like a weed so it doesn't really require any special agricultural practices. It can grow in drought or lots of water, so it's something that is available to people, and they don't know about the downside of consuming this over a long period of time. Wolcott Dunham got very interested in whether or not vitamin C might inhibit the development of neurolathyrism in people that unavoidably are exposed dietarily to this legume that contains the neurotoxin. He set up a research program that involved guinea pigs because guinea pigs do not synthesize vitamin C so you control the amount of vitamin C in their bodies very carefully. He gave guinea pigs the toxin responsible for neurolathyrism and they developed hind leg paralysis, very similar to what happens in people. Men, for some reason, seem to be especially vulnerable to this. However, if you gave the guinea pigs the toxin and co-administered vitamin C, you could completely prevent paralysis, or if there was paralysis it was transient. So that was quite encouraging. Also there are pathological changes that can occur in the liver that did not occur when the toxin was co-administered with vitamin C. Vitamin C seemed to be protecting their nervous system and livers from pathological damage caused by exposure to the toxin. I think Wolcott was very interested in taking this to the World Health Organization and trying to get them to do human studies and find out whether this might be a low-cost remedy for the public health problem in regions of the world where people eat the grass pea. If you could allow them to continue eating the grass pea and give them low-cost vitamin C supplements with the advice 'go ahead and eat this but be sure you take your vitamin C,' then perhaps it would be less of a serious problem. I think a little bit later he got interested in aflatoxin toxicity in guinea pigs and how that could be attenuated with co-administration of vitamin C.
CP: Did he stay around at the Institute? SL: He did, he stayed at the Institute for a very long time, retired, he and his wife were very charming, very, very nice people. He retired towards the end of our tenure there at Palo Alto. SL: John Leavitt was recruited from Johns Hopkins and may have known Raxit Jariwalla there. Leavitt was recruited to direct our Laboratory of Molecular Carcinogenesis, which was established by Emile with the idea of expanding the Institute's research into more molecular-biological areas rather than just strictly orthomolecular medicine. John was very interested in using two-dimensional gel electrophoresis protein profiling technology to understand fundamental differences between normal cells and cancer cells. He discovered the mutant beta-actin protein, which seemed to be present in most tumor cells that he looked at, and maybe T-lymphocytes as well, but not in normal cells. A lot of his work was geared toward understanding mutant beta-actin. He did some transgenic work and secured a patent with a colleague at Stanford that was commercialized, one of our rare successful commercializations of patents. I think Stanford actually led the commercialization effort there, but nevertheless the Institute benefited from royalties from Leavitt's invention. CP: How about Jeffrey Bland? SL: Jeffrey Bland was recruited to the Institute back in the late '70s from the University of Puget Sound, where I think he had been a chemistry professor. He joined the Institute to work both on the metabolite profiling project and to develop a new project, which was called the Nutritional Supplement Analysis Laboratory. The idea was to analyze nutritional supplements for their dissolution in the gastrointestinal environment, analyze them for purity, and find out if the label represented what the ingredients were. The goal was to award some sort of certificate or seal, kind of like the UL underwriters label - Good Housekeeping seal of approval – to products that passed these stringent qualifications. It was an interesting program and, again, way ahead of its time. I think it was so far ahead of its time that they had a very difficult time finding companies that wanted to participate; they were selling their nutritional supplements very happily and I guess didn't see the need for any kind of competitive advantage that might be gained from this "Linus Pauling Institute Nutritional Supplement Analysis Seal of Approval." Eventually that program was disbanded. CP: And he moved on from there? SL: He moved on from there. He had developed a career as a public speaker and was very interested in writing and lecturing and set up a business in Washington. SL: Jerzy Jurka did work that was primarily related to Emile's interest in molecular evolution. I don't know what Jerzy's training was - a biologist or a biochemist - I don't believe he was trained as a chemist, but I don't know what his degree was in. He had a very robust grant from the Department of Energy to analyze alu sequences and conservation of alu sequences in DNA and junk DNA over time. He became, after the Institute's reorganization, the Assistant Director of Research with the role, ostensibly, of helping Linus Pauling when Linus Pauling was absent or providing input to make strategic decisions about research programs at the Institute. He was offered a job at Oregon State University but declined to come north because, I think, his wife is a physician and had a very good practice in the San Jose area, and they liked living there. CP: So he was one of the few who was made the offer? SL: I don't know if he was specifically offered a position, but clearly OSU was interested in recruiting him. SL: Greg Spicer also was recruited by Emile to work in this area of molecular evolution. Greg was working on divergence of different invertebrate species using PCR, which at that time was a fairly new technology. I helped him with some of his work. We'd go off into the Santa Cruz mountains with butterfly nets and collect different dragonflies and damsel flies. He would run their DNA through the PCR and try to estimate the divergence of these different species. When the Institute reorganized, Greg was one of the new employees at IMMS. He continued to maintain his lab and office in the building at 440 Page Mill Road but reported to Emile as part of IMMS. And after IMMS ended Greg took a position at San Francisco State in the Department of Biology as a biology professor and he is still there. CP: So he probably knew Crellin Pauling then. SL: I don't know if his time overlapped with Crellin. Crellin may have retired before Greg got there, but I am sure that they had colleagues in common. CP: How about Keene Dimick? SL: Keene Dimick I did not know personally. I saw him at various events, fundraisers, and dinners, and I know that he was one of the three founders of the Institute for Orthomolecular Medicine before it became known as the Linus Pauling Institute of Science and Medicine. Dimick, I believe, was the person that actually provided some of the funds to get the Institute off the ground in the early days. There were grants transferred from Stanford but there were also operational funds that I believe were provided by Keene Dimick. He had been instrumental in a company that later, I think, was sold to Varian. CP: Do you know much about his background? SL: Aleks was recruited to work with Jim Fleming in the Sasakawa Aging Program. Jim was very interested in finding out the role of genes in longevity, lifespan in fruit flies primarily. He was doing a lot of work with fruit flies and also produced transgenic fruit flies that over-expressed certain endogenous antioxidant enzymes to try to find out if they would be more protected against toxic insults and how that would affect their lifespan. Aleks was working very closely with Jim when Jim retired from the Institute to go to Washington, to Spokane, which is where he and his family are from. Aleks started working with Matthias Rath who had been recruited to set up the cardiovascular disease laboratory at the Institute. CP: My memory was that she was invited to come to OSU too? Or is that false? SL: She was one of the candidates being reviewed by Oregon State University. She didn't want to move from the Bay Area, her husband had a good job in the Bay Area and many people who live in the Bay Area choose to live there – they like living there. I think she certainly liked living in the Bay Area. And when the Institute left, she joined Dr. Rath's research enterprise in Santa Clara county and she still works there. CP: How about Fred Stitt? SL: Fred Stitt was someone who joined the Institute in the 1980s. He had worked with Linus Pauling at Caltech and had contributed, to some extent, to the publication of The Nature of the Chemical Bond. I know he is thanked in the acknowledgements of that book. I think he had known Linus Pauling for a very long time. I am not quite sure what his role at Caltech was; whether he was there as a graduate student or graduate fellow. I don't believe he was on the faculty there. Fred was a very nice guy, a very intelligent, perceptive person. He helped organize some of the LPI public responses for requests for information because by the mid-1980s we were really being burdened by letters and phone calls requesting very specific information, people looking for all kinds of recommendations, questions about whether they should take vitamin C or high-dose vitamin E. It had become almost untenable, but we felt that we were obligated to be compassionate and as responsive as possible, and Fred really helped organize responses to people. He categorized some responses and then developed packets that could be sent to people depending on the nature of their question. He did a very good job at that and also responded personally to a lot of people. Then he became the newsletter editor, so he worked for at least several years as the editor. CP: So he would have worked closely with Cameron on that outreach? SL: He worked closely with Cameron and Linus Pauling as well. CP: The rest of the names that I have on my list are affiliates rather than people who were actual employees and the first one of those is Martin Kamen. SL: I never met Martin Kamen. I know that he had a close relationship with Arthur Robinson. I don't really know much about his involvement with the Institute. I believe he was on the Board of Associates, but I never had any interactions with him. CP: How about Robert Cathcart? SL: Robert Cathcart was a physician; an orthopedic surgeon who died a few years ago. He was what might be called an orthomolecular physician and had gained some notoriety for developing the Cathcart prosthesis. Many people who had had artificial hips implanted had problems because they didn't wear well prior to Cathcart's device. Cathcath measured the actual relationship between the hip and the socket that the hip joint sits in. From that he deduced that it was not perfectly spherical, which is what most of the mechanical joints were, it was more ellipsoidal. So he came up with a new prosthesis that had a much longer biological life. I think he had done some work at Stanford. I don't know that he got his medical degree at Stanford but he had been at Stanford in some capacity and then had a private practice in Incline Village, Nevada and had been treating people there. He became very interested in Linus Pauling's work on vitamin C back in the 1960s. One issue that Cathcart became focused on was how much vitamin C do you give to someone to have a therapeutic response? That wasn't known, of course, at the time. And the transport mechanisms, or the way vitamin C gets from the gastrointestinal system into the blood stream, was not known either. People knew from simple experiments that if you take a massive dose of vitamin C, only a fraction gets into the blood stream and that a lot just passes through the gastrointestinal tract or is excreted. But the mechanisms were vague and unclear. People really didn't have much of a clear idea of how vitamin C gets into the blood stream. Cathcart observed that normal healthy people seem to be able to tolerate, and it's quite variable, maybe a couple of grams of vitamin C in a single dose before they get the laxative effect, loose bowels. He observed that the same people, when sick, could tolerate much, much larger doses of vitamin C before that laxative effect was produced. So he decided that might be a good guideline to use in the therapeutic application of vitamin C. He recommended to his patients to take as much vitamin C as you can to reach that bowel tolerance threshold effect, that laxative effect, then decrease slightly and continue taking those doses of vitamin C until your symptoms are resolved. He used that pretty successfully to treat people with the flu and common cold and other problems. He became quite close to Linus Pauling, and I think they talked and visited each other often. CP: Another very important person, Irwin Stone. SL: Irwin Stone was a biochemist who had heard Linus Pauling give a lecture in New York City about how Pauling wanted to live a few more decades because so many fascinating things were happening in the field of chemistry and he really wanted to be around to see all these developments. I believe Stone followed up that with a letter to Pauling saying 'well, there's no reason why you should limit your expectations for a long life. If you start taking vitamin C I think you could live another 50 years.' Stone laid out the rationale for the belief that vitamin C might have value in promoting health span and decreasing the incidence of age-related diseases like cancer and heart disease and be effective against the infectious diseases. Stone had done a pretty good literature review, and he passed that along to Linus Pauling. Pauling became quite intrigued and he and his wife Ava began taking a couple grams of vitamin C a day and made the observation that they were no longer getting severe colds as often as they seemed to get them previously. Pauling became, I think, convinced that vitamin C had some value. And of course this led to Vitamin C and the Common Cold and Pauling's own meta-analysis of the clinical literature. I think Stone was really a catalyst for Pauling's specific interest in vitamin C.
CP: Did you ever meet him? SL: I did meet Irwin Stone a few times. He lived in San Jose, had some kind of small institute in San Jose that I think eventually was wrapped up with some help from Rick Hicks and other people at the Institute. He came to see Linus Pauling periodically and I did see him at dinners and events. CP: Do you know where his own interest in vitamin C was spurred? The story I believe is that he got in a car accident and he and his wife were able to heal themselves with vitamin C.
SL: I think that's right. Maybe because, you know, if you have wounds you need optimum collagen synthesis and vitamin C is required for collagen synthesis. Maybe he just put two and two together and decided that for optimum healing of his wounds, both bone damage and tissue damage, that vitamin C would be really important. I don't know. Another fellow, Hugh Riordan, who was a long-time friend of Linus Pauling and very important figure in the field of orthomolecular medicine, was a psychiatrist by training. He became very interested in vitamin C and cancer and did a lot of clinical work in Wichita, Kansas, and had a whole center devoted to the development of high-dose vitamin C, oral and intravenous, as adjunctive therapy for cancer. Hugh told me that he initially became interested in vitamin C as a medical student when he had a poisonous spider bite and decided to treat it with high-dose vitamin C. He measured vitamin C content in his own urine and even after massive oral doses, vitamin C content in blood was extremely low, so he deduced that the vitamin C was detoxifying the spider venom and all of the sequelae-like inflammation from the spider bite. He became convinced from his own experience that vitamin C had some therapeutic value that really had not been recognized by conventional physicians. CP: Stone was a physician, was he not? SL: No he was not. As a matter of fact, I'm not sure that he had a Ph.D. He might have had an honorary Ph.D.
CP: How about Armand Hammer? SL: Armand Hammer was a retired physician who had found lots of success in the business world. I think one of his earliest successes was selling pencils to Russia during communist rule. Made a lot of money that way. I'm not quite sure why he and Linus Pauling became friends, but he was awarded the Linus Pauling Humanitarian Award at one point. He came to visit Pauling at the Institute a number of times and I believe Pauling visited him in southern California a number of times, probably at banquets or honorary dinners and things like that. I met him a few times. One time in the 1970s, Rick Hicks had a document that needed to be signed by Armand Hammer that day so I took a flight from San Jose to Los Angeles in the morning and caught a cab to Occidental Petroleum which was headquartered in Westwood. I went up to see Armand Hammer, chatted with him for a few minutes, got his signature, caught a cab back to LA airport, flew back to San Jose, and returned with the document right in time. CP: Pauling had a relationship with Arthur Sackler too. SL: Right. Sackler; another physician who had a lot of success in the business world, in particular as the publisher of Medical Tribune. I think Sackler was very intrigued by Pauling's ideas in orthomolecular medicine and gave Pauling quite a lot of space to write letters and articles in Medical Tribune. I think he also won the Linus Pauling Humanitarian Award. He was at some of these banquets and Pauling birthday parties. I think that Arthur Sackler once expressed to Pauling the desire to help the Institute in a very substantial way. But unfortunately he died before he was able to put those plans in place or take any specific action. SL: Frederick Klenner was not someone that I met, and I am not sure that Linus Pauling ever met him either, but his work had been published in regional medical journals in the southeast United States, going back I believe to the 1940s-50s. And Klenner had started to work with very high-dose vitamin C, typically given intravenously, to treat all kinds of maladies, including poisonous snake bites, spider bites, insect bites, as well as serious illnesses, like polio. Klenner had become convinced that this had great value. The therapeutic response was very dramatic in many cases. I think Pauling was very intrigued by his clinical work and the anecdotes about the utility of high-dose vitamin C and treating different conditions and diseases. SL: Arthur Cherkin was a Ph.D. who had some position at the VA hospital in Los Angeles and had worked with Art Robinson and Linus Pauling, perhaps in the metabolite profiling program, obtaining samples or something like that. He was on the Board of Trustees and served as a secretary of the Board of Trustees for many years. But I only saw him rarely. SL: Norman Cousins was the publisher of Saturday Review - it was a major American periodical - who had been diagnosed with a nervous condition that I believe was sometimes fatal. Norman Cousins became interested in Pauling's work and thought that perhaps vitamin C might have some value. So he embarked on a self-styled therapeutic regimen that included lots of laughter; I think he watched a lot of old funny movies and TV shows and also took very high-dose vitamin C. He seemed to recover very well from his illness, and he and Linus Pauling became good friends. CP: They had a connection from the old peace groups from the '60s too. SL: I didn't know that, but it wouldn't surprise me. CP: Okay, well the last three are a little more contemporary with what the Institute has been up to lately, but the first is Bruce Ames. SL: Bruce Ames is someone who Pauling, I think, knew from Caltech when Ames was a graduate student there. 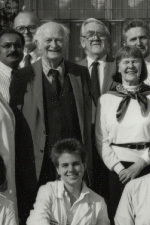 Bruce Ames was friendly with his family - Peter Pauling and Linda Pauling and I am sure had some interactions with Linus Pauling back in those days too. Bruce became a professor at the University California-Berkeley where he spent most of his career, won the National Medal of Science, and developed, very importantly, something called the Salmonella Mutagenicity Test. But everybody calls it the Ames test. It's a way of using mutant bacteria to determine the mutagenicity of certain environmental or dietary compounds, and also the anti-mutagenic effect of certain protective compounds. He is very highly regarded in the scientific world. He did work in the 1980s on antioxidants and in 1989 he published a paper with Balz Frei, who is now the director of the Linus Pauling Institute, showing that ascorbate is an outstanding antioxidant in human blood. The body has many different types of antioxidants, some are taken from our diet, like vitamin C and vitamin E, and some are synthesized in cells in the body and provide endogenous antioxidant protection. Uric acid is another antioxidant that can be produced in the body from dietary factors. Balz Frei and Bruce Ames evaluated the importance of these different antioxidants. And it turns out that vitamin C was by far and away the most powerful antioxidant in human blood. That work, of course, appealed to Linus Pauling, and Bruce and Balz were invited to come to the Institute back in California - it was the day of the big earthquake in 1989 – and give back-to-back seminars on the importance of vitamin C's antioxidant capacity in blood. Bruce had been very interested in the free radical theory of aging and oxidative damage that might lead one to increased susceptibility to cancer, for instance. Bruce compared the free radicals that were generated by normal respiration and mitochondrial activity to hits from cosmic radiation. These can damage DNA increase vulnerability to cancer. He had been very interested in that and protection by antioxidants and vitamin C.
More recently he has developed a triage therapy. It's kind of extended Pauling's ideas about orthomolecular medicine. In Pauling's 1968 paper he talked about a couple of genetic diseases that result in people's inability to metabolize certain dietary compounds. Bruce extended to maybe thirty or more genetic diseases that can be remedied by high-dose vitamin therapy, including some of the B vitamins. It's a logical extension of some of Pauling's early ideas in orthomolecular medicine. CP: He was the first person to receive the Institute's prize if I recall. SL: In 2001, when we organized and convened our first Diet and Optimum Health Conference, Bruce was the first recipient of the Linus Pauling Institute Prize for Health Research. That acknowledged his pivotal and seminal work in orthomolecular medicine and work that resonates with the mission of the Linus Pauling Institute. Bruce also has been on the Extramural Scientific Advisory Board of the Institute since Balz Frei was recruited. So he's had a lot of terrific critical feedback on the development of the Institute, and I think it could even be one of his early ideas that led to the specific development of our Micronutrient Information Center. CP: How about Lester Packer? SL: Lester Packer is also a retired professor from UC Berkeley who has written many papers and books, including some popular books, on what he calls 'the antioxidant network.' He has been interested very much in vitamin E. Maret Traber, who is one of our principal investigators, worked in Dr. Packer's lab at UC Berkeley, much like Balz Frei worked in Bruce Ames' laboratory at UC Berkeley. And also Tory Hagen, who directs our Healthy Aging Program, was working in Bruce Ames laboratory at UC Berkeley. So we have alumni from the Ames and Packer labs. And Emily Ho, who is one of our principal investigators, worked in the Ames lab. Lester is very interested in this concept of the antioxidant network, which refers to the complex interplay between the endogenous and exogenous antioxidants in the body and how they can cooperate to protect us from oxidative damage. He is interested in vitamin E, lipoic acid, some of the carotenoids, vitamin C, superoxide dismutase, catalase and all these other antioxidants. He's got terrific organizing skills as well and played a role in the founding of the Oxygen Club of California, which holds annual meetings in California, all organized around this theme of free radical chemistry and the effects of free radicals on human health and disease. CP: And there is a close relationship between the Oxygen Club and the Institute. SL: There is a very close relationship because many of our principal investigators have been members of the Oxygen Club for a long time. We co-sponsor each other's conferences. Most recently, as kind of a manifestation of that close relationship, the Oxygen Club of California donated a very nice bronze sculpture from Krysten Cunningham to the Linus Pauling Institute, which is housed in our lobby in the Linus Pauling Science Center. CP: Well the last person on my list is Mark Levine. SL: Mark Levine is a clinical physician and medical researcher at the National Institutes of Health who has had a long-standing interest in vitamin C and the therapeutic application of vitamin C. He was among the scientists at the NCI and the NIH that convened a meeting that was written up in the pages of Science as 'vitamin C gets a little respect.' And Linus Pauling, of course, participated in that meeting. So did Gladys Block, who became a trustee of the Linus Pauling Institute of Science and Medicine; Balz Frei was there. And Jariwalla and Connie Tsao may have attended that as well. It was a meeting organized at the NCI to talk about the role of vitamin C in cancer and health and disease. Mark has carried out very elegant, carefully controlled pharmacokinetic studies on vitamin C, because he has always been interested in what happens to vitamin C once you take it, how much gets into the bloodstream. So he carried out some very interesting pharmacokinetics studies that helped inform the Food Nutrition Board's change in 2000 for the RDAs for vitamin C. He showed, for instance, that oral vitamin C, you can take as much as you want but you can rarely get above, for the average person, about 100 micromoles concentration of vitamin C in the blood, because the amount of vitamin C that gets into the bloodstream is limited by transporter molecules. He didn't make these discoveries about the transport mechanisms, these molecules that transport vitamin C across cells. They are on the cell surface, and they determine how much vitamin C gets into the cells. So the cells that line the intestines have these transport mechanisms, and they determine how much vitamin C gets into the blood stream from the intestine. It's limited - it just doesn't diffuse through. After Mark's pharmacokinetics studies with both oral vitamin C and intravenous vitamin C, it dawned on him that 'wow, maybe that explains why the Mayo Clinic studies failed to show any benefit for high-dose vitamin C because they gave vitamin C only orally whereas Cameron typically gave vitamin C intravenously and orally.' And when you give it intravenously you bypass these control mechanisms and you can get very, very high concentrations in the blood that, depending on the dose, can be 70 or 100 times greater concentrations of vitamin C in the blood than are attainable by oral vitamin C. Mark has since gone on to show in a series of really great experiments, cell culture experiments and small animal experiments, that these very high concentrations of vitamin C generate hydrogen peroxide in the milieu around tumor cells. And then the hydrogen peroxide can diffuse into the tumor cells and cause their death by different mechanisms, including interfering with mitochondrial machinery and causing apoptosis. CP: So where is this line of research at this point? Did he continue to human trials? SL: Yeah, the line of research is so engaging. Now that we have a better mechanistic understanding of vitamin C and cancer and we have a better understanding of the pharmacokinetics, this has led to a number of preliminary clinical trials. Phase I clinical trials will be followed up by other clinical trials, I'm sure, that will get at these issues of safety and combination with other drug therapy, because there is some evidence that for example, some of the arsenic compounds that are used chemotherapeutically are potentiated by vitamin C, which also tends to decrease the side effects of the arsenic compounds. Lots of questions remain: optimum dose of vitamin C, frequency of the dose, slow drip infusion versus periodic injection a few times a week. All those questions really need to be answered and characterized much more carefully. We really don't at this point have any predictive ability, so we don't know which cancer patients are going to benefit most from high-dose vitamin C. Clearly it is not a panacea for all cases of terminal cancer, and there are many people that have not benefited from high-dose IV vitamin C, and that needs to be understood as well. Interestingly, this goes back to work that Pauling published with Japanese researchers back in the '80s showing in cell culture experiments that vitamin C can generate hydrogen peroxide that kills tumor cells. That's when Pauling's attention started to focus more on the cytotoxicity of vitamin C and degradation products of vitamin C - direct effects against cancer cells as opposed to humoral host resistance. I think it's very promising. A lot needs to be learned. The patient population in Scotland may be quite different from the contemporary population in the United States. Many complementary physicians are now using high-dose IV vitamin C as adjunctive cancer therapy. But we don't yet have good data acquisition and analysis of all those reports. CP: So there might be some validation there for Pauling and Cameron, 35 or 40 years later. SL: I think there will be validation for Pauling and Cameron. And interestingly enough, if you look in some of Pauling's writings, particularly after the Mayo Clinic trials, he and Cameron and others came up with criticisms of the Mayo Clinic methodology. The patients had undergone prior chemotherapy in the first trial or vitamin C was suspended in the second trial. And then patients started to die when vitamin C was stopped abruptly. There seemed to be fairly high concentrations of vitamin C in the urine of some of the placebo patients, which makes people doubt that they were true placebo patients. They had a lot of criticisms about the methodology, but at least Pauling noted that there was a big difference between the mode of administration. And although they didn't have evidence at the time to suggest that IV vitamin C was definitely more effective, Pauling speculated that this may have some importance. I think he was very insightful there as well. CP: Well okay Steve, that's the end of my list. I would ask if there are any other people you can think of that were important to LPI over the years that we didn't touch on. If you wanted to talk about them, otherwise we're done. SL: Yeah I would have to finish unpacking my office and look at some of the early employment rosters. I think we've touched on most of the principals. But clearly there were a lot of other people who worked there, 75 or 80 people worked at the Institute at different times. Ed Blaisdell is one who did a lot of data analysis. Steve Burbeck, I think, had research experience in audiology or psychology, but also had a strong background in computer science. When we were developing this program of protein profiling - and just to give you a brief introduction to that, if you are interested in finding out differences in gene activity that may distinguish cancer cells from normal cells, you need some way to quantify or visualize those protein products. And one way of doing that is to incubate those cells with S-35 methionine, which is a radioactive isotope combined with methionine, which is an amino acid which gets incorporated into proteins. As these cells are making new proteins and growing, they are incorporating this radioactive methionine. All the proteins that incorporated methionine now become radioactive. You can then collect all the cells, rupture them, which is called cell lysis. And then you end up with a little radioactive cell lysate and you can separate the proteins in porous polyacrylamide gels on the basis of their isoelectric point, which is related to a pH gradient, and also on the basis of their molecular weights. So you do a two-dimensional separation of these proteins under the influence of an electric field. You end up with a rectangular gel that can be dried onto a piece of filter paper. Now you have this gel that contains all these radioactive proteins dried onto a piece of filter paper. You can put that up against a piece of film in a cassette for some period, then you develop it in a film processor. And if you look at the film you'll see hundreds or thousands of little spots that correspond to a radioactive emission from the methionine residue on the proteins. So the question is, how do you quantify that? You have all these spots of varying intensity and size all over this piece of film. Part of Steve Burbeck's program at the Institute, and Jerry Latter participated in this as well, was to develop software that would help us analyze these films and come up with quantitative information. We bought a drum scanner on which you can mount one of these films and it spins around really fast and it digitizes these spots. So now you've got information in the computer about the position and intensity and size of these spots and you can use that to create a pseudo image on a computer screen. The position of all these images on the computer screen correspond to the spots that you saw in the X-ray film - exactly the same only now they can be color-coded for intensity and you can get quantitative information. Steve Burbeck and Jerry Latter and others worked for years in a program to help us analyze those gels and developed really sophisticated algorithms to help us understand and match. We had a semi-automated system that would allow us to match spots from one gel to another. They spent quite a number of years developing software for that kind of analysis. So it was a big program at the Institute.